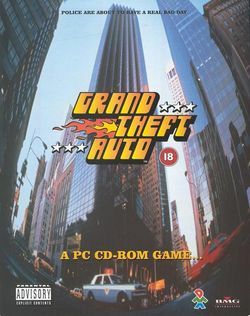 Grand Theft Auto is set in [[Liberty City in GTA 1|Liberty City]], [[City of San Andreas|San Andreas]] and [[Vice City in GTA 1|Vice City]] in 1997. These renditions of the cities are vastly different from their more well-known counterparts in the [[GTA III era]]. In the game, the player can choose from one of about eight [[protagonist]]s, and even change their names. It begins with only one level to choose from. Law enforcement in GTA 1 is generally characterized as a obstacle in the game, appearing in the force of [[police]] officers who are ready to pursue arrest the player if they player has committed sufficient criminal acts. 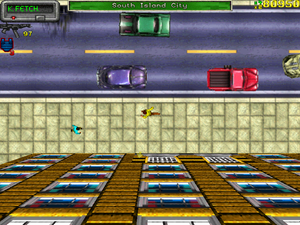 The player's wanted level is defined by the number of police heads seen on top of the screen; the more police heads the player amasses by commuting more crime, the more determined the police will be to subdue the player. The player can have up to four police heads, which at this point leads to very hostile officers.